Habit: Annual to perennial herb; hairs simple or 0. Stem: erect, simple or branched, glabrous or hairy distally. Leaf: basal petioled, generally rosetted, dentate to pinnately lobed; cauline petioled or sessile, bases lobed or not. Inflorescence: terminal. Flower: sepals erect to ascending, base generally not sac-like; petals generally yellow, clawed. Fruit: silique, linear, dehiscent, segmented, round or 4-sided to flat parallel to septum; valves 1-veined, glabrous; terminal segment conic to cylindric, 0--3-seeded; stigma entire to +- 2-lobed. Seed: (4)10--50, in 1 row, spheric to ovoid. Species In Genus: 35 species: Mediterranean, Eurasia, some naturalized +- worldwide. Etymology: (Latin: cabbage) Note: Brassica including most important vegetable, seed-oil, condiment crops in Brassicaceae. Habit: Annual, branched +- from base, stem, leaves densely stiff-hairy. Stem: (1)3--7(10) dm. Leaf: basal rosetted, persistent, petioled, pinnately lobed, serrate-dentate, lateral lobe pairs 4--10; cauline few, base tapered, not lobed. Flower: sepals 2.5--4.5 mm; petals 4--7 mm, 1.5--2(2.5) mm wide. 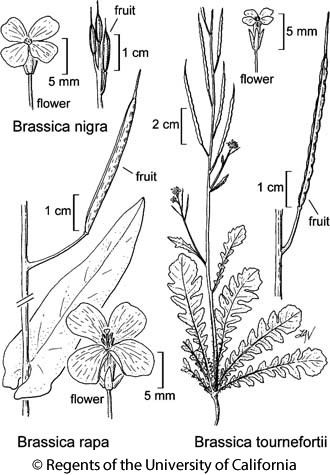 Fruit: spreading to ascending, 3--7 cm, 2--4(5) mm wide, cylindric, narrowed between seeds; terminal segment 10--20 mm, 1(3)-seeded; pedicel spreading, 8--15 mm. Seed: 1--1.2 mm wide, spheric. Chromosomes: 2n=20. Ecology: Roadsides, washes, open areas; Elevation: < 800 m. Bioregional Distribution: SW, D; Distribution Outside California: to southern Nevada, Texas; native to Mediterranean, southwestern Asia. Flowering Time: Jan--Jun Note: Locally abundant. Citation for this treatment: Ihsan A. Al-Shehbaz 2012, Brassica tournefortii, in Jepson Flora Project (eds.) Jepson eFlora, http://ucjeps.berkeley.edu/eflora/eflora_display.php?tid=16085, accessed on April 22, 2019. SW, D; Markers link to CCH specimen records. Yellow markers indicate records that may provide evidence for eFlora range revision or may have georeferencing or identification issues. Purple markers indicate specimens collected from a garden, greenhouse, or other non-wild location.